While a global market slowdown is impacting the U.S. economy, and the threat of another potential recession looms, the U.S. economy continues to chug along showing slow growth. Major U.S. retailers are facing another challenging year in 2016. However, the U.S. outdoor industry is providing motivation and building on the confidence prevalent in the market. "Our situation here is unlike the European outdoor industry, which is not growing, and has shrunk for its consumers. There is nothing driving the European economy," explains David Parkes, president of Concept III Textiles. "However, the U.S. outdoor industry is in good shape, due in part to the strong support provided by U.S. textile suppliers!" New textile innovations are consistently being developed by outdoor suppliers, which support their branded manufacturing partners. As a result, the major brands continue to design new technical apparel and gear that contribute to the success of the U.S. outdoor industry as a whole. In reviewing these trends, the FabricLink Network examines several products showcased at ORWM’16. CORDURA showcased its new CORDURA® 4EVER Fleece™ fabric in the CORDURA® + Strudtur Studio 4EVER Fleece Collection of men's and women's hoodies and sweatpants, which offer long-lasting comfort and the cozy feel of fleece apparel. The CORDURA® 4EVER Fleece™ fabric is available from the following mills: Yoonia (Asia), Cyberknit (U.S.), and Ifateks (Europe). In addition, CORDURA featured its CORDURA® Combat Wool reflective fabric from Chia Her, made from a blend of wool/CORDURA® nylon with reflective accents. W.L. Gore's GORE® THERMIUM™ products address the insulation issue of water penetration from the outside the garment, which can occur in cold and wet conditions, including light rain or snow. Insulated outerwear can only keep you warm in cold conditions, as long as the insulation material stays dry. 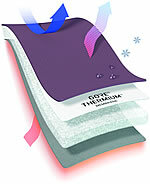 GORE® THERMIUM™ provides for a warm, pleasant feeling of being durably protected in insulated garments. 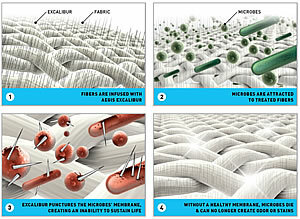 Microban International Ltd., leader in built-in antimicrobial product protection, launched its Excalibur technology for footwear and apparel, combining antimicrobial / odor-absorbing functionality, and prolonging product deterioration for up to 40 home launderings. Excalibur's proprietary bonding process provides optimal antimicrobial performance for polyester fabrics and fibers. The treatment was engineered for outdoor enthusiasts, who want to be comfortable in footwear, mid-layers and outerwear, no matter the climate. Schoeller showcased its Cosmopolitan collection of multi-functional fabrics. Schoeller ecorepel® provides sustainable water and dirt repellence, 3XDry® assists with moisture management, coldblack® protects from UV rays, and c_change® membrane provides wind and water proofness. Warming and cooling fabrics are possible through phase-change materials and natural odor management is possible through wool fabrics and active>silver. These individualized qualities provide comfort and mobility through all kinds of weather. Polartec, a consistent provider of innovative textile solutions, announced the launch of its first cooling platform, Polartec® Delta™. Delta is a permanent mechanical wicking fabric that allows athletes and adventurers to dress for performance in warmer climates. Inspired by the design of car radiators, the new fabric provides for a highly breathable base layer with wicking capabilities, while reducing skin cling, and allowing for quick drying without the use of any chemical treatments. Nikwax, a manufacturer of high quality cleaning and waterproofing products, announced it collaboration with DownLite, a premiere manufacturer of down and feather, and synthetic bedding products, in the development of Nikwax Hydrophobic Down™ (NHD). The new down product is a water-based flourocarbon-free branded solution that offers safe and reliable WR performance. NHD treated down will stay dry longer and maintain its loft, even when wet. Bemis Associates, a manufacturer of innovative Sewfree® bonding solutions, launched three new products at ORWM'16: 1) DriSeam, Bemis' latest generation of Seam Reinforcement Tape (SRT), is the first functional performance SRT that repels water and wicks away moisture; 2) FlowFlex is a lightweight, stretchable overlay film for performance fabric; 3) Chromaflex Film adds high visibility that bends and creates color shifts as a garment moves. Concept III Textiles, known for the development, sourcing and production of fabric-based finished products, highlighted several innovations that show promise for 2016, including: 1) Polygiene®, an antimicrobial treatment that prevents the growth of odor-causing bacteria and fungi at the source using low concentrations of silver salt, which is naturally present in soil and water; 2) Dry-Tex, a supplier of laminate fabrics that uses Porelle® to create highly breathable membranes; and 3) ABMT, a sustainable, innovative knitter and dyer of high quality Merino/Merino blends.